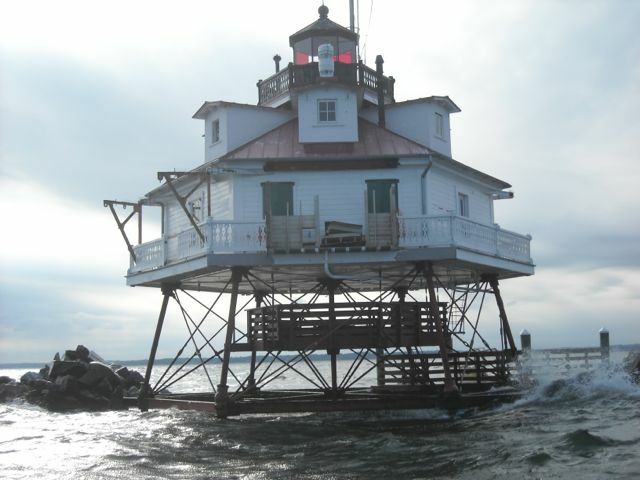 Workday: Thomas Point Shoal Lighthouse – Oct 3, 2014 – Chesapeake Chapter U.S.L.H.S. As the volunteers leave for the day something is missing! 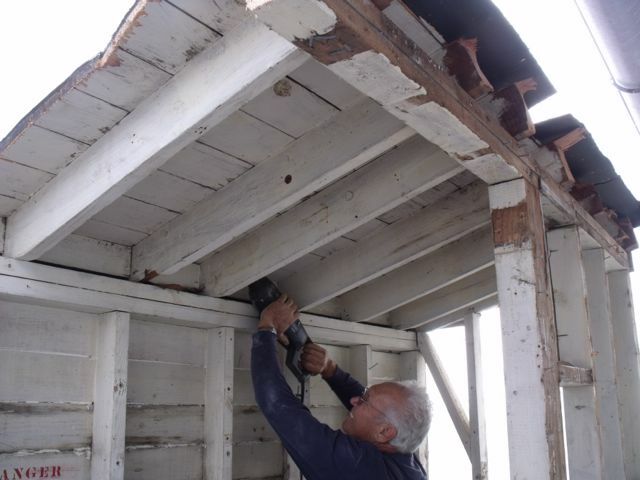 Three volunteers went out to focus on the main project of dismantling the dilapidated cantilevered storage shed. 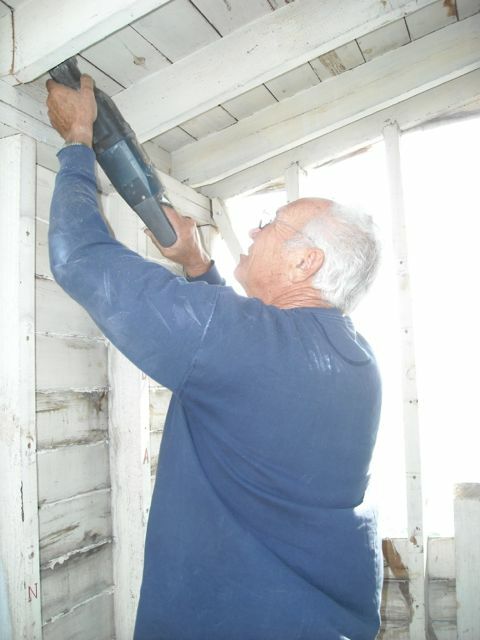 Howard used a reciprocating saw to cut the rafters, beams and siding. Tony helped move the old lumber to the decking near the floor hatch and hammered in the old nails so nobody would be injured. All three worked on dismantling the shed. This was a large project and took most of the day to dismantle about 85% of the structure. They found that the posts were not in real bad shape, but the siding was in very poor condition, more fibrous and spongy than solid wood. After cleanup and moving the bad lumber onto the Audacious, the group attached orange plastic safety fencing to keep visitors from entering the shed project area. 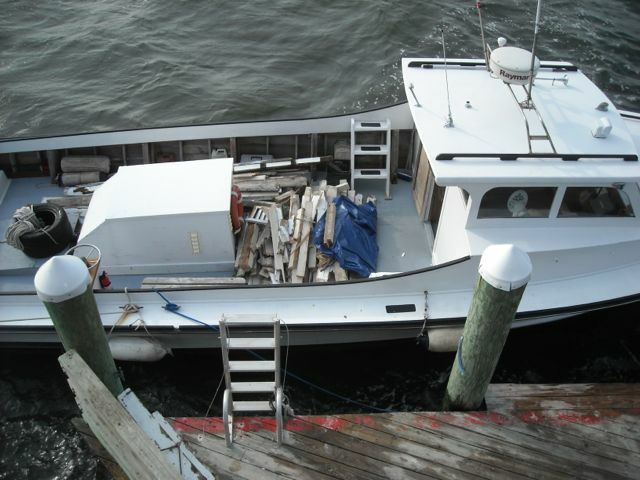 The old wood was carted off to shore. 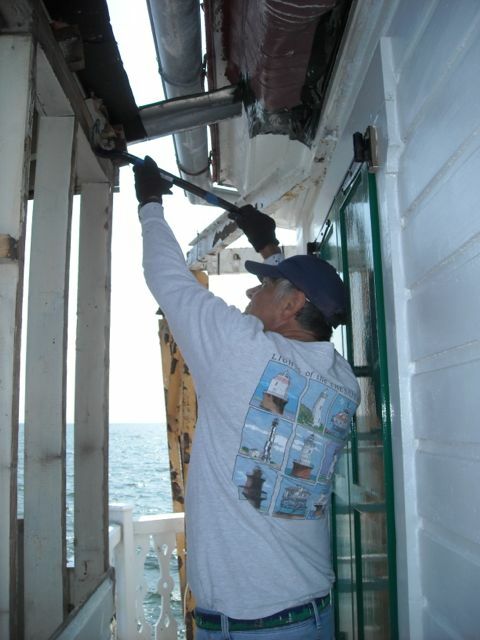 There were a few other jobs completed by the intrepid trio. 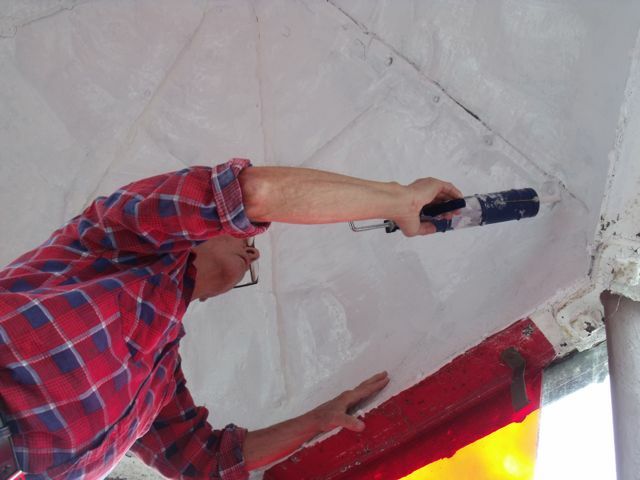 While Howard focused on the shed Hobie caulked the gaps in the ceiling of the lantern dome and added the refurbished brass air vents to the side. 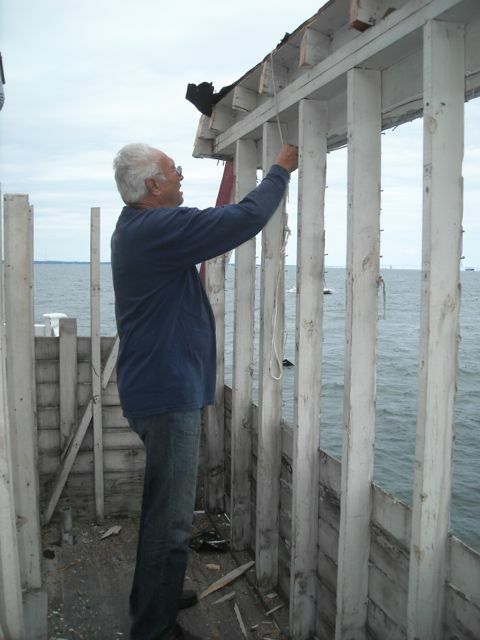 Tony helped with the shed and took care of cleaning the deck. 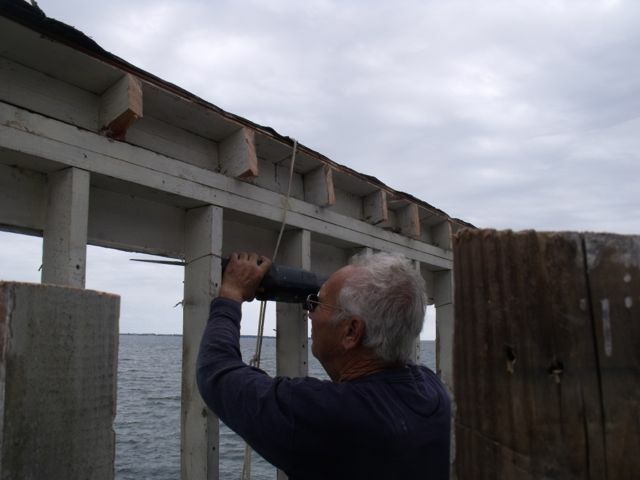 One more visit and the rest of the shed will be gone. They still need to remove the old floor, some half-posts and some siding. Howard works on roof area. Wood in the Audacious for the ride back to shore. 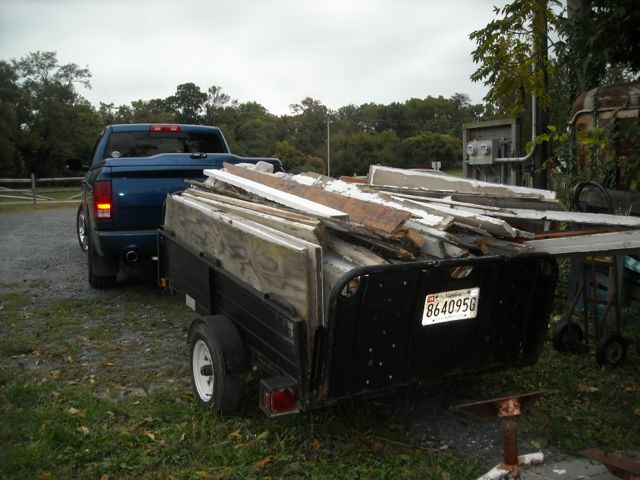 Remains of shed being carted off. Hobie caulks lantern room roof.